several matches which the child had reached, and in some manner had ignited one of them on a tin cup with which he had been playing, and in this manner his clothing was set on fire. Sidney Cross, grandfather of the child who lived next door at 1322 Virginia Avenue, heard the cries of the child and hastened to his assistance. When he arrived he found the child's clothing a mass of flames and his own hands were severely burned in extinguishing the fire. Dr. J. H. Spicer was called, but when he arrived he found the child dead. The house in which the tragedy occurred was at 1322 Virginia Avenue. On April 24, 1917, a large three story brick building of the Co-operative Supply Company at the corner of Virginia Avenue and Laing Avenue was completely destroyed by fire which started in the rear of the adjoining building at about 8:50 in the evening. The stock and fixtures were also destroyed. The ladies' ready-to-wear store of L. Berman and the S. T. Little Jewelry Store, which occupied the same building, also lost heavily. The loss to S. T. Little was $4,000 and the loss to L. Berman was $3,000. The loss to Herbert Ears on who lived over the store of J. T. Mahaney was estimated at $200. The stock of J. T. Mahaney also suffered great damage from fire and water. 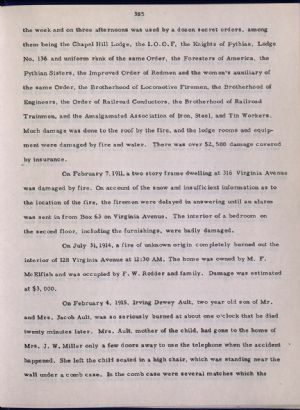 The South Cumberland, Central and West Side city fire companies, the Chapel Hill Hose Company, the Baltimore and Ohio Railroad and the N and G Taylor Tin Plate Company volunteer firemen responded, all of which did fine work. On August 28, 1921, flames completely gutted the interior of the grocery store of S. T. Maphis at 1305 Virginia Avenue early in the morning. The loss was estimated at $5,000.